Click to listen to episode (2:54). From the Cumberland Gap to the Atlantic Ocean, this is Virginia Water Radio for the week of July 22, 2013. This week we feature a song written by “The Bard of the Chesapeake Bay,” with an easily digested lesson about aquatic food chains. Have a listen for about 55 seconds. You’ve been listening to “The Sunshine Bankers,” written by the late Tom Wisner and performed by Teresa Whitaker and Frank Schwartz on “Singing the Chesapeake,” a 2012 songbook and CD from Finding Home Productions. As the song describes, plankton are the foundation of many aquatic food chains or webs. Plankton are primarily microscopic, floating organisms, and this group includes phytoplankton, which are plant-like algae; zooplankton, which are animals; and bacteria. 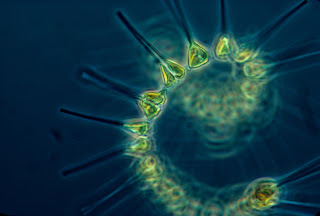 Phytoplankton capture the sun’s energy through photosynthesis, and this captured energy in turn provides food for zooplankton, oysters, fish, and other aquatic organisms. Just as financial banks are crucial to the economic health of many human communities, planktonic “sunshine bankers” are key parts of the ecological health of aquatic communities in the Chesapeake Bay and many other water bodies. Thanks to Ms. Whitaker and to Mr. Schwartz for permission to use this week’s music. Phytoplankton in New York Bight area, photographed in about 1973. Photo made available for public use by the NOAA Photo Library (National Oceanic and Atmospheric Administration/U.S. Department of Commerce), online at http://www.photolib.noaa.gov/index.html, accessed 7/18/13. “The Sunshine Bankers” and “Singing the Chesapeake” are copyright by Teresa Whitaker and Frank Schwartz, used with permission. “Singing the Chesapeake" is songbook and CD collection of songs by Tom Wisner, Mark Wisner, and Teresa Whitaker, published by Finding Home Productions and by C.H.E.A.R.S, an environmental arts and education organization. More information is available online at at www.findinghomeproductions.com and at http://www.frankandteresa.net/Welcome%20.html. “The Sunshine Bankers” was previously recorded by Ms. Whitaker and Mr. Wisner on “We’ve Got to Come Full Circle: Chesapeake Song and Story for Young Hearts,” a 1984 album on Smithsonian’s Folkways Records (http://www.folkways.si.edu/index.aspx). A Washington, D.C., native and long-time Maryland resident, Mr. Wisner dedicated his life to learning, singing, and teaching about the Bay and its protection. More information about Mr. Wisner is available from the Smithsonian Folkways “Artist Spotlight” at http://www.folkways.si.edu/explore_folkways/tom_wisner.aspx; from Thomas A. Wisner, 79: 'Bard of the Chesapeake' sang about the bay he loved, Washington Post, 4/4/10; and from Tom Wisner, his love of Chesapeake, will carry on in his songs, Bay Journal, May 2010. This episode’s music and information were used previously in Episode 31 (week of 8-30-10), now archived. Please contact Virginia Water Radio to request access to the audio for Episode 31. “The Bridge” marine-education Web site of the Virginia Sea Grant Marine Extension Program at the Virginia Institute of Marine Science, online at http://web.vims.edu/bridge/plankton.html?svr=www. This episode may be useful to support Virginia Science SOLs 2.5, 3.5, and 4.5.